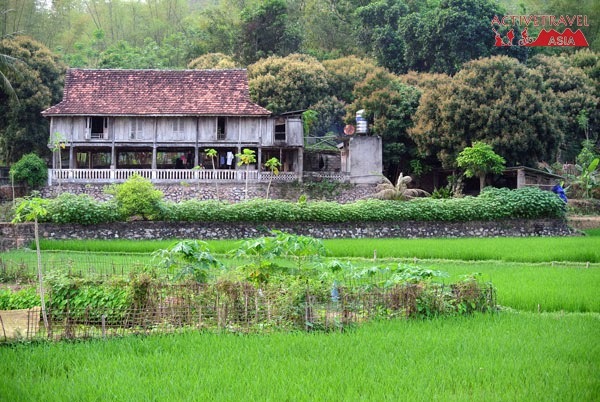 Leave Hanoi when you hunger for a countryside dip of the Real Vietnam Countryside! Although Hanoi is a great place to stay, it is still a big city with everything you need. After a while you are just curious what is out there. 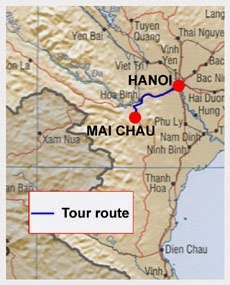 Because we’ve got loads of time, we’re staying in Hanoi for a while (we will travel through Vietnam in a few weeks together with family who’s coming over) but making short trips to areas not far from here. So, the last few days we’ve stayed in a little village called Mai Chau. Maybe you already read some of my posts about the local market in Mai Chau where we’ve seen a lot of interesting and shocking things as well. The village is not that special. A lot of concrete buildings, shops and big trucks on the main road. 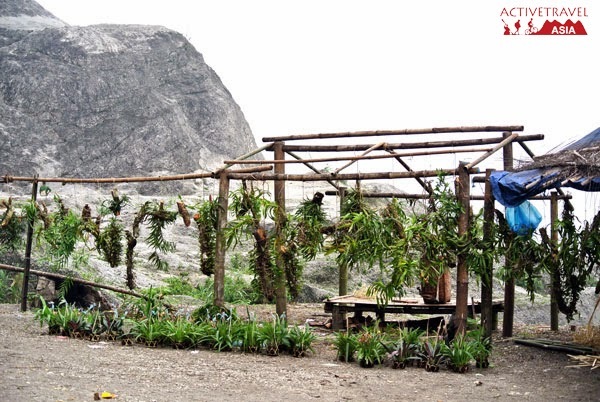 Behind these concrete building are hundreds of rice fields and locals working on the field. Did you know that the women maintain the fields? This is from a long long time ago when the women worked on the fields and the men did nothing. Nowadays the men have some business to attend but the women still work on the field. This is a pretty hard job, working in the sun all day, bent over or squat. That’s why they wear these typical Vietnamese hats, to protect them from the sun. In these rice fields you can find rice plants and lots of water of course, but did you know that there are also snails, snakes, crabs, frogs and eels living in these waters? Some men go frog or fish hunting during the night as these animals are a good income and apparently delicious.. Oh by the way the frogs make a awful loud sound during the night. 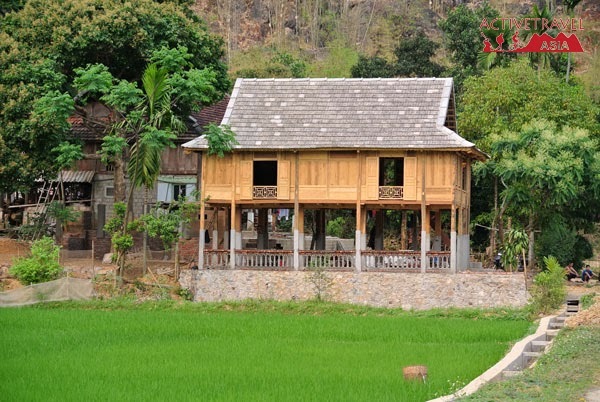 While we were there, we stayed at Mai Chau Nature Place which has bungalows and a homestay in the village. I would recommend the bungalows or a dorm, as these are situated a bit more out of the village and more in the rice fields. They serve you breakfast, lunch and dinner if you want to. All vietnamese food! You can rent bikes here and they have a dance show with traditional Thai dance almost every night. Are you interested in the crafts they do in Mai Chau? The women make their own bags, cloths, bracelets and much more by sewing, embroidery and weaving every day. I’ve written a post on the Dutch DIY Blog de TweakFabriek in Dutch, but the pictures will explain the whole story. Have a look for my posts on this amazing blog where you can find really great DIY and inspiration posts. In area around Mai Chau they build their houses a bit different than the ones in Hanoi nowadays. In former times the people who lived there, had a lot of trouble with the rain fall and floods. That’s one of the reasons why they build their houses on stilts. The other reason is because at that time there was still a wild tiger living in this area. The schema of the houses is very simple. There is only one big room on one side of the house and a kitchen on the other side. That’s why they builded two stairs to enter the house. One staircase was for the men, to receive guests and the other staircase was for the women to go to the kitchen. The main big room was usually used as a living room and bedroom. The Thai people slept on the floor with a blanket. The whole family lives together and eventually the children have to take care of their parents. When one of the kids get married, the last one that does, has to take care of their parents. They will live together in one house and if they want “a few nights of privacy” as our tour guide explained, they have to sleep in the kitchen. and safe but you have to be comfortable with vermin. Insects and other little animals are every where. By the way, do you see the concrete on the right side of the rice field? That’s how they regulated the water for the fields. It’s amazing to see their irrigation. It’s also a lot of work to maintain the rice fields. As you can see there is a lot of weed growing on the sides and also between the rice plants. They have to remove this every day as otherwise the weed will use the water instead of the rice plants. This is the kitchen floor of a typical Mai Chau house. Bamboo flooring, which is very strong but maybe not so hygienic. As I told you, there is a lot of vermin walking around the house. 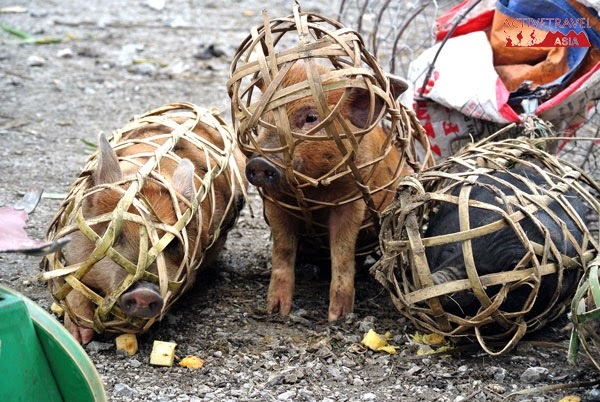 This is a good example of the methods they use to keep these little animals away from food. This bowl with water keeps ants from climbing up the pantry for food. 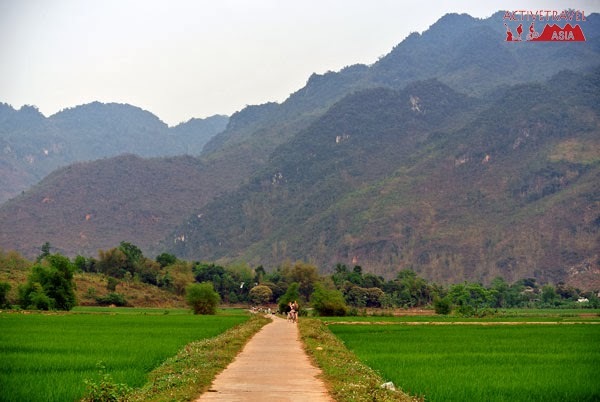 ACTIVETRAVEL ASIA would like to recommend Trekking Mai Chau tour.Mai Chau is a mountainous area of outstanding natural beauty, inhabited by a Thai and H’mong ethnic minority groups. This trip offers a great combination of cultural expedition and trekking. We trek for three days through the spectacular scenery, visit remote and stay overnight in local homes where we have the chance to get to know these hospitable villages. From the mountainous region of Mai Chau, we travel back to the nation's capital, Hanoi.